MainJudaismHave smartphones caused us to fail in our parental responsibilities? 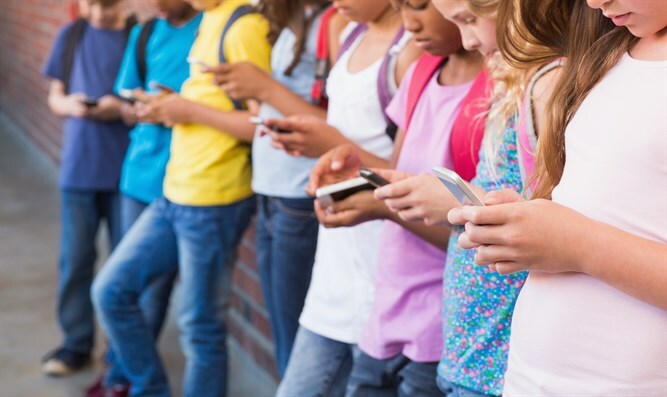 Have smartphones caused us to fail in our parental responsibilities? Are we failing in making our children independent beings? The Boomers were not like the generation of the Second World War. Generation X was not like the Boomers…. So it goes. So it has always been. The world turns for each generation. And each generation is different from its predecessor. These changes are sometimes more marked than other times, but still, research shows a clear, gradual evolution of change. Until now. Research shows that, with the Millennial generation, change came not only in degree but in kind. The experience of young people today is radically different from those who came of age only a very short time ago. What can explain this shift? We are taught that a father is obligated to teach a son to swim. The directive sounds quaint. Teach a son to swim? Even the great Gaon Rav Yosef Shalom Elyashiv was baffled as to why teaching “swimming” per se is an obligation a father has to a son. Every “danger” posed by swimming is posed by any number of other things. So too every benefit swimming might bring. So, what is it that makes swimming unique? Rav Elyashiv, in trying to answer this question, presents a thoughtful and, for us, a compelling interpretation.In Divrei Aggadah, Devarim 14:9, he suggests that swimming is unique in that it compels active participation. Drop a piece of wood in a river and what happens? It might remain above the surface of the waters, but no one would suggest it is “swimming”. At best, it merely floats along; its path and eventual destination defined by the river’s current. His point is that to swim is to be actively engaged, to willfully employ skill to counter the physics of the water, of their environment. To do otherwise, to “not swim” is at best to float aimlessly and, at worst, to sink and drown. This then is fundamental to what the Talmud is teaching us. A Jew must be a swimmer. He cannot be passive. A Jew must be in control. He cannot be swayed by the worldly currents and cross-currents that buffet him. Society, culture – life and experience – these are turbulence, they are threatening and destabilizing currents. To live a Jewish life, a life of Torah, is to do more than merely stay afloat; to go wherever the currents carry you. To live a life of Torah is to swim against these currents. How powerfully has the smartphone affected the lives of the Millennials? These changes have affected young people in every corner of the nation and in every type of household. The trends appear among teens poor and rich; of every ethnic background; in cities, suburbs, and small towns. Where there are cell towers, there are teens living their lives on their smartphone. It has affected them so powerfully that it seems to have altered their DNA! Even more, Rav Elyashiv suggests there is even greater meaning in this obligation. Implicit in it is that the Jewish people are being compared to fish. V’yidgu larov – “and may they proliferate abundantly like fish within the land” (Bereishit 48:16) And not just any fish but a kosher fish – that is, a fish with scales and fins. Fins to propel and guide the fish through the water, to endow the fish with the power (analogous to the inner strength a Jew must possess) to go against the current. The fish is not passive. The fish is not victim of the tides and currents. A fish’s destination is determined by the fish. This is the essential lesson in the Talmud, that a Jew must be master of his movement in the world; he cannot allow himself to be swayed by outside forces. And scales, the second feature that make a fish kosher, protect the fish from harm. So too, the Jew must have “scales” that protect him from harm. For Jews, these “scales” are Torah learned and mitzvot performed. V’yidgu larov. The verse poses an insight and a puzzle; an insight that Jews can be compared to fish; a puzzle in that, “…proliferating as fish within the land…” is counterintuitive. After all, shouldn’t fish proliferate within water? The answer to this puzzle speaks even more powerfully to our point. To be as the kosher fish, with its fins and scales, a Jew must possess inner strength and armor to remain kosher regardless of the environment where he finds himself. No matter the currents, no matter the environment, a Jew’s “fins” must find him swimming in the true direction through life. Regardless of the difficulties, his “scales” protect him and his soul. In that same article, we learn of the deep threat to these young people. The “smart phone”. Such a wonderful, brilliant device. In one’s hand, one can not only communicate across the globe, but carry a library of books, thousands of songs, games to delight, apps to while away the time… When one is lost, a smart phone can help him find his way. When one is in a strange city and seeks a particular kind of restaurant, the phone can direct him to it – along with the most efficient way to get there. Perhaps even make reservations at the same time! We can get news on our phones. We can download commentaries. Parashiot hashavuah. Daf Yomi. We have been seduced and deceived! As Delilah brought down Samson, so too are we brought down by our phones! The iPhone (and its many competitors) has sapped us of our strength; it has insinuated itself within our inner, intuitive workings, and snuck past our natural, Torah defenses. So insidious has the iPhone become that it no longer “merely” dominates our waking hours (studies suggest that the average cell user checks his phone 35 times a day; that 56% of parents own up to checking their devices while driving; 75% of smartphone users admit to have texted while driving at least once…) but it also affects our “resting” hours. More than half of all smartphone users check their phones within an hour of going to sleep and nearly three-quarters reach for it as soon as they get up. 61% of users sleep with their phone turned on under their pillow or next to their bed. I’ve been in restaurants and seen a table of diners each sitting at their table looking at their phones rather than the real live, in the flesh people seated next to or across from them! Many years ago, a Marshall McLuhan said, “the medium is the message”, suggesting that the medium was at least as important as the content of the message in how it is perceived. This is surely the case with smartphones. In raising the alarm about smartphones, I am not focusing on content. Yes, the Internet can be a very dark place of truly horrific messages and content. But, as I suggested above, it is also a place where one can find endless shiurim, where Torah knowledge is available at the tip of one’s fingers, where it is possible to engage our greatest sages anytime, anywhere. It is not the content but the thing itself which has lured us into allowing our “fins” to atrophy. The world is so much easier with our smartphones. We move through it with our own, personal soundtrack playing. How delightful. And how dangerous! Yes, it is possible to maintain our “scales” while using our smartphones; to engage in Torah learning. But we must remember that our obligation is to teach our sons to swim; to use their fins and to be in control. It is not the online experience per se that is the danger. Clearly, there are wonderful shiurim to be found on line. Perhaps that restaurant you are searching for is the only kosher establishment in town. No, the online experience is not necessarily the danger. The danger that exists is the device itself, the thing we have entered an unwitting and self-destructive relationship with. We text endlessly and incessantly. Whatsapp. Snapchat. FBing. Instagramming. Twittering (we even have a “Twitterer in Chief!) We do it all. All the time. Even when there is a living, breathing, engaging, wonderful person within arm’s length of us! Our lives are relentlessly, painfully, depressingly determined by FOMO (fear of missing out). We suffer anxiety attacks if we are separated from our phones for even a short time. The behavior is not just analogous to an addict. It is the behavior of the addict! And no one is more indicative of someone who has lost control than an addict. The Torah-driven, Jewish life is to be exactly the opposite of the life of an addict. It is to be a life of meaning, of engagement, of control. And yet I almost never see a Jew – shomer Shabbos, mitzvah performing Jews – without a smartphone. I have seen good, observant mothers pushing strollers not engaging with their children. I know of fathers taking phone calls as soon as they’ve walked into the house, seeming to forget that there are children there that need and deserve their attention. Even the young teens “inherent” desire to be independent is stunted by the smartphone! I do not advocate for a world without smartphones. A Jewish life is not a Luddite’s life. We can no more get rid of our smartphones than we can return to horse drawn carriages and kerosene lanterns. No one can sensibly argue that the benefits of technology should be erased. But it is not our task or our obligation to erase technology. It is not our task to create the oceans with their mighty tides and currents. Our obligation is to teach our children to swim in those oceans! Our obligation is to teach our children to use their smartphones, not be used by them! V’Yidgu… We are meant to be fish all the time, in every environment. Fish cannot be rendered non-kosher. Other animals can be. We need to be kosher fish, not any other kosher animal. The smartphone is insidious and seductive, it is brilliant in its intuitiveness. It can be a lifesaver – literally. It can be a wonderful tool – when we control it, rather than allow it to control us. We need to teach our children – and ourselves!! – to “swim like the fishes.” To strengthen our fins. We need to swim! The currents are treacherous. The safe harbor is always so near and yet so far away.